Yes, this idea is all over the internet … but I’ve fallen in love with them and just had to share them on my very own post. 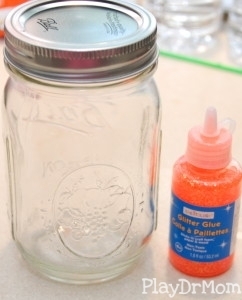 I created mine by filling the Mason jar halfway with the warm water, emptying the glitter glue into the jar, (using more warm water to rinse and empty the remaining glitter glue out of the container … adding the water and shaking vigorously), adding more warm water if needed to fill the jar to the top, and then putting on the lid. I found I needed to shake the mixture very well for awhile and also let it sit for a bit so that the glue would dissolve and fully mix with the water. 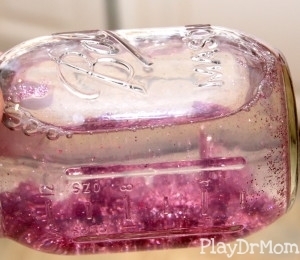 (however, even when it is fully mixed the glitter will settle awhile after it is shaken.) As it would make sense … the greater the proportion of glitter glue to water the more dense the water becomes and the glitter “hangs” in suspension for longer. Experimenting with different amounts can give you a variety of effects. I also discovered that NOT ALL GLITTER GLUE works for this project … a couple of kinds that I had (they tended to have larger glitter) would NOT dissolve in the water (like the above clumpy pink glitter!). The Glitter Glue that I found works best is the Createlogy Brand sold at Michael’s. 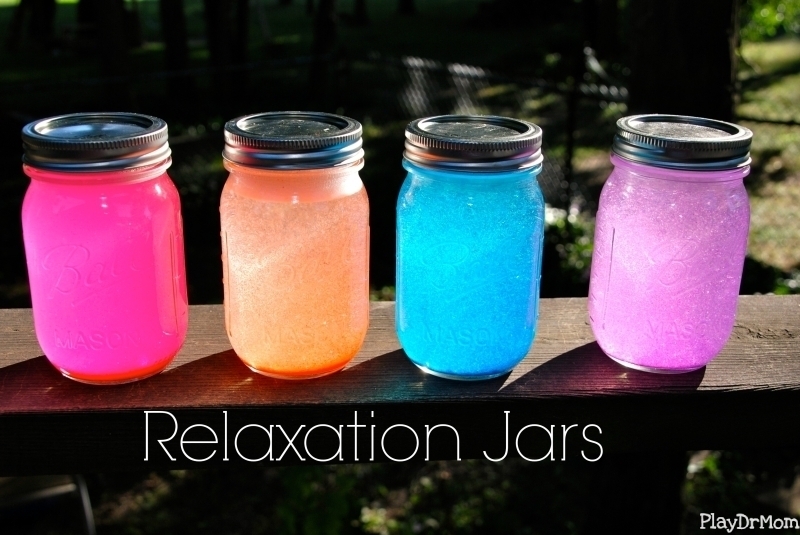 These beautiful, easy to make jars are absolutely wonderful for staring at a relaxing … just losing yourself in the swirling glitter for a few moments helps to center oneself. 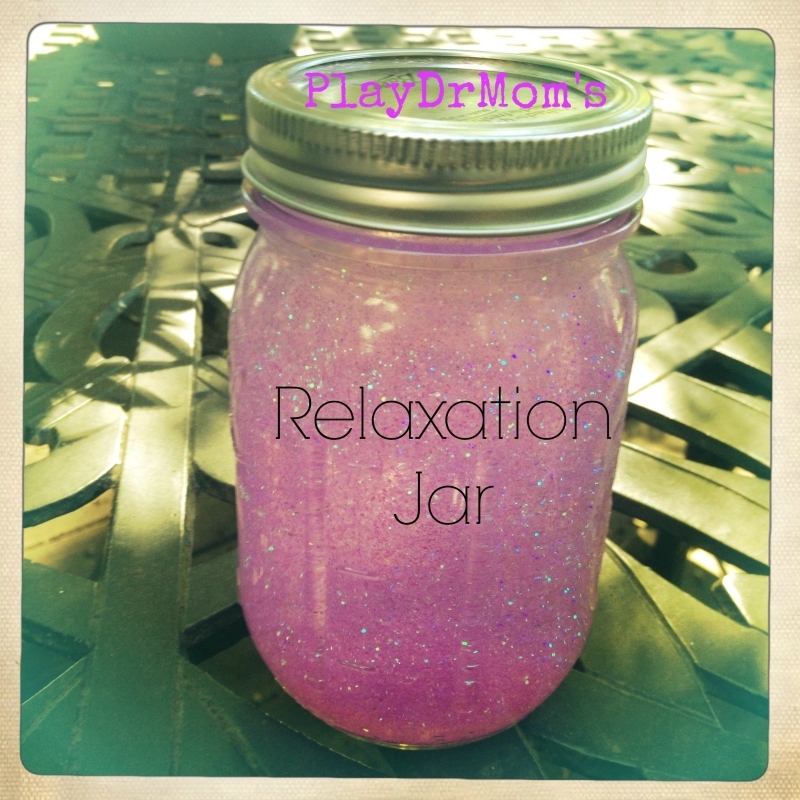 They’ve been used as “Glitter Jars“, “Calm Down Glitter Jars“, “Calming Glitter Jars“, “Calming Glitter Bottle“, “Mind Jar and awesome gift card free printable” (that has a great explanation of how you can use them), and “Time-out Jar“. Whatever they are called … or however they are made (there’s a few variations) they are truly wonderful for helping kids settle down and relax. The idea is that by the time the glitter settles at the bottom the viewer would be calmer. Creating these at home, school, or in therapy with a child would be a perfect, simple hands-on activity that they could take home as a great tool to help center them. Whether they tend to be anxious or hyperactive … Heck, anyone could use this tool to help chill out during the day! Follow Laura Hutchison @ PlayDrMom’s board Self-Regulation/Calming Techniques on Pinterest. I have also seen this a lot but you provide some really useful tips such as gluing the lid closed to avoid spills and it is good to know that not all brands of glitter glue work. Thank you for sharing. I found you through Tutus and Tea Parties Pinning party. Thanks a bunch for your comment, Bonnie! I was worried about it being kind of a copycat post … but wanted to share mine too. I really appreciate you taking the time to comment! This looks like so much fun. I am adding this to our list of to-do’s. Thanks for the great idea. I am going to make these for my daughter. She definitely needs something to help her calm down at times and this might do the trick to keep her focused. Thank you for sharing at our Pinning for Play link party! Pinned this! They look great, I think I want one for myself! 🙂 Hopping by from Pinning for PLAY! Laura M recently posted…September to Remember $200 Cash Giveaway! What pretty ones! I love the different colors. Thank you for sharing at Sharing Saturday!! Hi Yvette! I believe the glue is a gel glue (rather than a white glue). Let me know how it works! Absolutely love the look of these – can’t wait to try them out, but will need to find myself some glitter glue… Thanks for sharing. We discovered that if you whisk the glitter glue in the warm water in a bowl before pouring it into the jar works better. That way you don’t have clumps and it works for most of the glitter glues. Great tip, Stacy! Thanks for commenting! What a wonderful craft! I like that not only does it have sensory components after you make it but also while you make it. 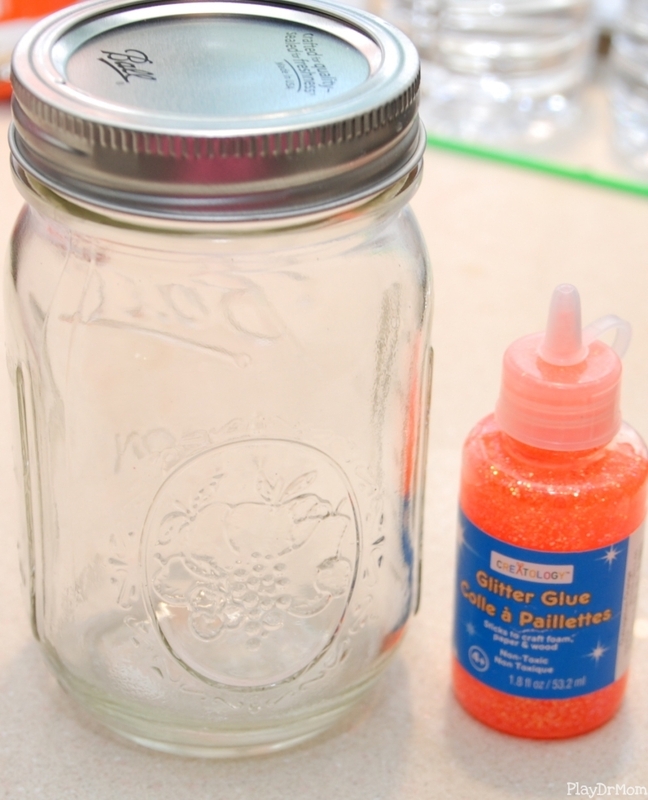 All the hard squeezing to get the glitter glue into the jar was a great treat! We also found that whisking the glue with the warm water in a big bowl before putting it into the jar worked better – less chunks of glitter this way. Wouldnt the top get rusty seeing as its metal. It might over time, but they are made for canning so the part of the lid the touches the water is coated. Mine aren’t rusted and I made them a year ago! Definitely! I LOVE using mine. My teenage clients LOVE them too. Thanks for your comment! Can these be used for just decoration? I was wondering if the glitter glue ever falls to the bottom of the jar? Sure they could be used for decoration! The glitter does fall to the bottom after a couple of minutes on most of the ones I have made, but one of them I used a lot of glue and extra glitter and the glitter always stayed suspended. You could try experimenting! What do you use for the coloring/tinting and in what amounts?? I would really like to make a set that color coordinated with the Chakras. Caitlin, that’s a wonderful idea! The color of the glitter glue is what gives the different tints. I think these would be cute, too, with small articles (little stars, hearts, etc.) suspended in there — even little fish in blue water! This reminds me of those glitter lamp that came out after the lava lamps, these are safer, no electrical use is needed. I have also made these by putting 2 tablespoons of corn syrup in water and adding glitter, shells, sand and any other objects that are fun to look at. Just add more corn syrup to slow down heavier objects. Then super glue the lids shut. Color with food coloring. I love blue with shells and sand. It doesn’t have a name – but I know that it was Createlogy pink glitter glue from Michael’s. I will totally have to try that! Great idea! I think these are awesome!! My idea would be to add a glow stick to them! Cool idea! I’ll have to try that too! My 9 yr old daughter has severe anxiety and we made these today to help her calm herself. My question is how do you prevent the white foam that is always on top after shaking? I tried spooning it out but it comes back every time. It’s almost like there’s soap in it. We used the same glue you recommended. Either way, she and I both absolutely LOVE these jars & made 8 of them! Hmm… not sure about that. I’ve never had any white foam in mine. Maybe there was soap in the jar before you added to it. I dont have young kiddos but I love the time out example! I should make a few for myself , especially if get really annoyed and or angry while driving. Just pull over to the side of the rd or go to a parkinglot. Grab my glitter jar shake the heck outta it put my seat so Im laying back a little and stare until all the glitter settles. That would prob be relaxing and calm one down lol. I’ve tried making this twice now but the glitter glue floats in one big clump rather than settling to the bottom! Help! What am I doing wrong? Some types of glue just don’t dissolve well. You may need to try a different brand. It does take a while for any glue to dissolve completely (like 12 hours). Hope that helps.